March Blizzards Bring April Sunshine? While we were in the cities for Easter last year, I am thankful to be celebrating Jesus' rising at our own home this year. After church, we plan to have a breakfast food feast, which is right up my alley. We're talking waffles, egg bake, fruit and possibly bread pudding. Breakfast is my favorite! Preschool has been all about the real meaning of Easter this week. My 5-year-old said when he thinks about Easter, he thinks about egg hunts (I'm a fan of Cadbury Creme Eggs myself). 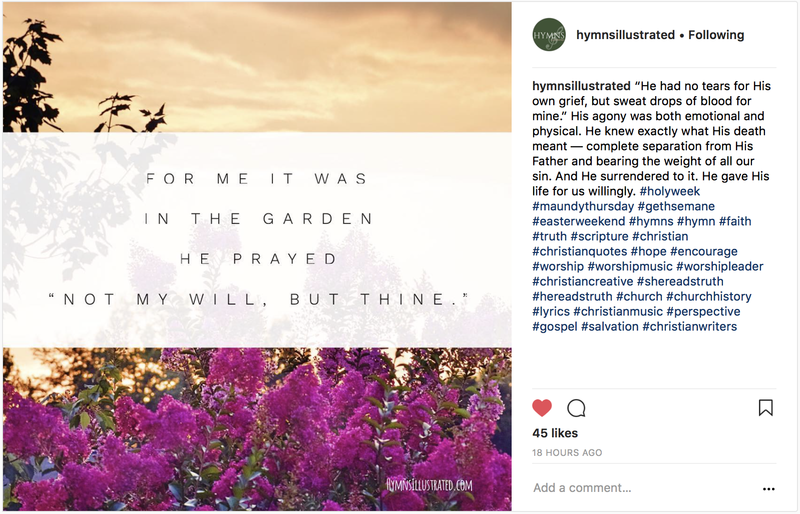 Those are cute and all but I explained that we are celebrating what Jesus did for us when He died on the cross and that He rose again from the dead. "So everything is about Jesus then?" he asked. On the running front, we were in a warm streak of weather for a while. So much that I packed away my winter running coat. It looks like the cold is going to return for a while but I'm feeling much more hopeful that shorts weather is near. Above-freezing temps make it so much easier to get out in the morning. And getting out in the morning makes it so much easier to fit in training runs! 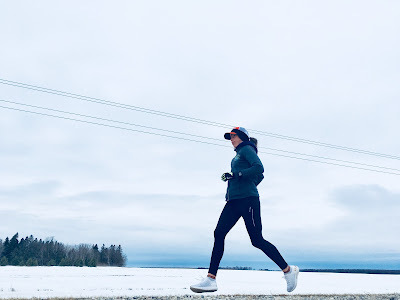 I am very gradually increasing my mileage to avoid injury as, though I forget it sometimes, I am still in the postpartum recovery stage (Baby will be 5 months next week :). Hopefully March blizzards bring April sunshine and snow-melting weather. I'm looking forward to bringing some great running products your way in April => think Orange Mud, FlipBelt and Under Armour. 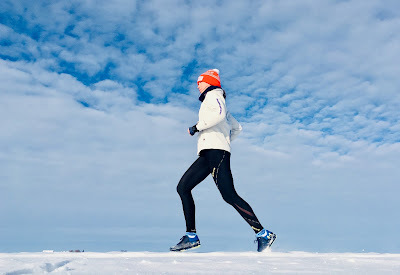 The running season is nearly upon us in the Midwest! (Treadmill) Progression Run 5.02 mi, 00:45 @ 08:57 avg pace with intermittent breaks to nurse baby, answer questions, help toddler. Who decided to sleep in this morning? Me! I need to remember how hard it is to run with the kids awake => motivation to get my tail out of bed at 5 am to run solo!. Easy Effort 6.25 mi, 01:00 @ 09:36 pace in the early morning. I made it outside! I had to loop around home to add more layers. It was 30°F but the damp air and breeze made it chilly! I’m hoping to make it out early tomorrow too. Early morning Progression Run 7.07 mi, 01:01 @ 08:36 avg pace with first 30 minutes at an easy pace and last 30 minutes at 8:00/8:30 per mile. Strength in Stride Stability A exercises that night. Long Run 14.29 mi, 02:00 @ 08:24 pace on a chilly, windy day. The temp said 20°F in town but the 20 mph winds stole any warmth I may have felt! Breaking it up mentally into 4 x 30 minute intervals made this run more enjoyable. Off. 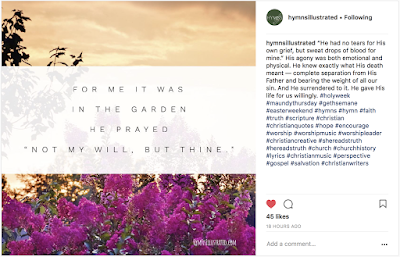 Easter => He is Risen! Do you have any Easter traditions? Or a favorite Easter food/treat? 4 weeks down, 12 weeks to go in training for the Grandma's Marathon! The first month went fairly well considering a sick bug got to our family last week and we're all back to somewhat "normal" this week. I'm tired but that was expected as our family has grown to three kiddos. Our littlest will be 7 months old on race day and this has brought back many memories from training with a baby back in 2013. Fitting in the miles with a baby isn't easy but some aspects are easier now. I feel like parenting is more relaxed with the third baby, we have a treadmill now and we aren't smack dab in the middle of the moving process. I may be three times more tired but the earlier factors do help! The below picture is our oldest son, E, at 4 months old while training for the Blue Ox Marathon and now our youngest, C, at 4 months old while training for Grandma's. Oh, how life has changed since 2013! Having three little boys (5 years, almost 3 years, & 4 months old) feels like a juggling act most days but they add so much joy and energy to our home! Each boy is certainly unique and a sweet blessing from the Lord. As for marathon training, it's harder to fit in training runs with three but I appreciate getting out for a long run all the more. It's not easy to do! I am SO thankful my husband and my mom take turns watching the kids on those Saturday long runs. It's a great mental break that I don't ever want to take for granted. Running a marathon with small children seems like insanity to some but I see it as a nice break. A nap is fine but I would rather spend a free moment running instead! Easy Effort 6.2 mi, 01:00 @ 09:40 pace. Early morning run and just above freezing. This morning was SO nice! I debated on going for 7 miles but figured... meh, let’s not be an overachiever now. hehe. McMillan's Strength in Stride Stability A circuit that night. (Treadmill) Progression Run 5.37 mi, 00:45 @ 08:22 pace. I started with 9-min-ish warm up, then progressed to the 8-mins, ended at 7:30 for last 5 minutes. Easy Effort 7 mi, 01:07 @ 09:38 pace. I made it out on this snowy morning. It was coming down a little heavy for my liking at some points but overall very pretty fresh snow. (Treadmill) Easy Effort 3.13 mi, 00:30 @ 09:35 pace. Quick run at my parents’ house. I didn’t have the heart to leave my hubby with a fussy baby this morning at 5 am. The run waited til this afternoon — hoping to get out tomorrow! What is your favorite part of spring? It's messy outside but I love the warming temps! Disclaimer: I received KT Tape to review as part of being a BibRave Pro. Learn more about becoming a BibRave Pro (ambassador) and check out BibRave.com to review find and write race reviews! Marathon training mixed with "real life" requires flexibility. Some weeks go as planned but most don't and that's part of the beauty in it! Over the years, I have learned that allowing for extra rest and recovery time is worth it. With the cold and a feverish baby in our house, this was one of those rest and recovery weeks. I cut back my mileage and did what I could in terms of running. Family always comes first! To aid my recovery, I have been foam rolling more and trying new-to-me kinesiology therapeutic tape, KT Tape. KT Tape is an elastic sports tape designed to relieve pain while supporting muscles, tendons, and ligaments and, as a BibRave Pro, I have been incorporating five products from the KT Tape family into my training. For a complete list of the KT Tape products, check out www.kttape.com/kt-tape-products. Postpartum recovery can leave the joints feeling wobbly so I decided to try a support wrap that focused on my knees. For the Full Support Knee Wrap, I used a half strip of blue PROTM and two full strips of black PRO EXTREMETM for each knee. I am a newbie to the KT Tape products and was surprised at how easy the pre-cut 10" strips are to work with. To apply a strip, I tore the paper backing in the middle of a strip. Then I used the papered ends to apply tension while placing the tape down on my knee to prevent the tape from sticking to my fingers. As I pressed the tape down, I gradually peeled away the paper backing. This application of KT Tape gives support, pain relief, and normal body mechanics without restricting motion or circulation like other treatments. By watching the easy-to-follow instructional video on the KT Tape website I was able to complete the Full Knee Support taping with ease. My tape job wasn't perfect but it was definitely helpful and not bad for my first time using KT Tape! I went out on the run and the support was beneficial. Back in the sophomore year of my collegiate tennis days, I wore a knee brace after having arthroscopic knee surgery. The knee brace was uncomfortably sweaty (gross!) and restrictive. This KT Tape would have been a much better option! My joints feel supported, the material is breathable and my movement still feels natural. After your workout, don't rip the tape off your skin! The tape peels off best after a shower or by using baby oil. The KT Tape products are great quality and they have a wide variety that covers every athlete's needs. Price varies per each product from $12.99 to $21.99 a roll. 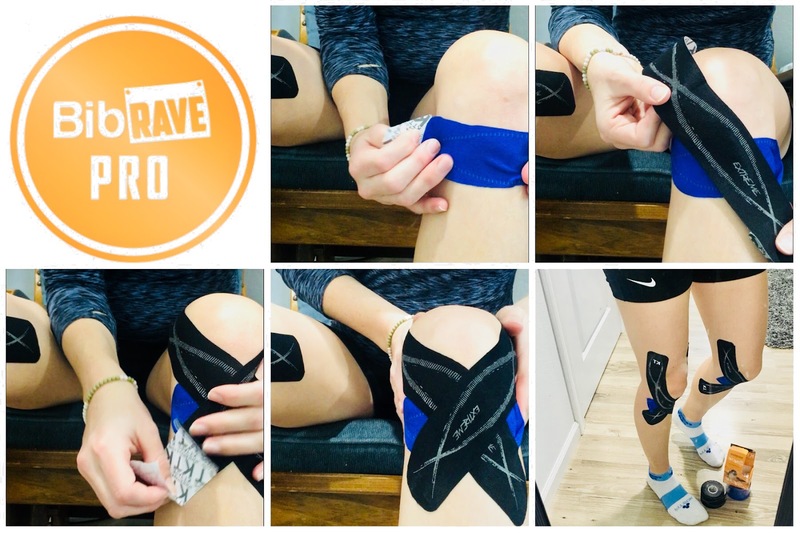 For runners on the mend from an injury, or trying to prevent re-injury, the KT Tape products are a better alternative than a brace in most cases. The quality material, strength of adhesion, and taping lifetime (lasting from 3 to 7 days!) makes KT Tape the best kinesiology tape I have seen! Use code "BIBRAVE30" to take 30% off of your KTtape.com order. Off. The hubs has been feeling under the weather and I can feel it's coming in my direction now too. Ear pain and swollen lymph node. Hopefully a rest day will help. (Treadmill) Easy Effort 3.1 mi, 00:30 @ 09:40 pace. This was all I could muster up. I’m having ear ache/cold/congestion problems and baby was up sniffling last night too. This is going to be a slow down week and I’m okay with that. Time for us all to get healthy again! Sick day. Ear ache and sore throat is still lingering for me. Baby was up most of the night with a fever from his shots. Better to err on the side of rest! Easy Effort 6.06 mi, 00:58 @ 09:37 pace. Still fighting this ear ache and cold. The upside is baby’s fever is gone and we slept better last night. Easy Effort 4 mi, 00:39 @ 09:41 pace. The hubs and I went out on a run together while Grandma and Grandpa watched the kids. Another beautiful day for a run. Snowy weather is soon to return. Which recovery products do you swear by? Disclaimer: I am promoting Athlinks as part of being a BibRave Pro. Learn more about becoming a BibRave Pro (ambassador) and check out BibRave.com to review find and write race reviews! Back in 2010, I toed the line to my very first marathon. Many, many memories have been made and sometimes painful lessons have been learned since then. Eight more marathons, a few half's and shorter distance races later, each of those races has added experience into my lifetime running bank. 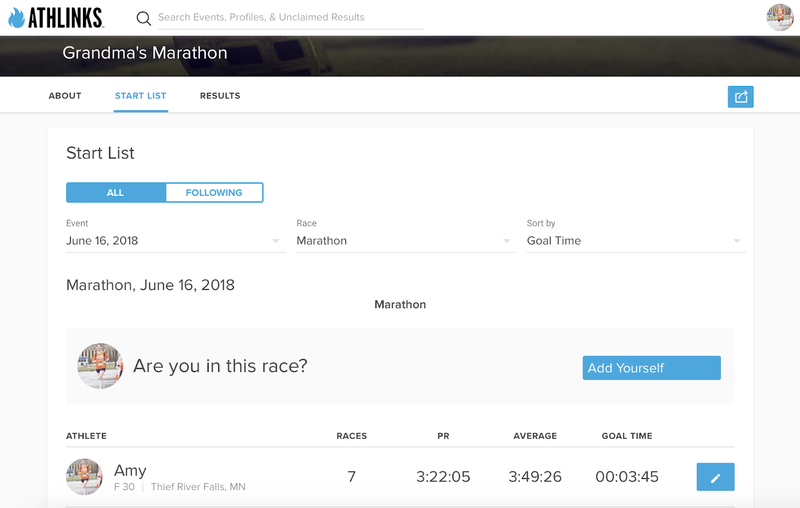 When I first started running, I made an account on ATHLINKS.com to keep track of my race results and it's a tool that I still use frequently. 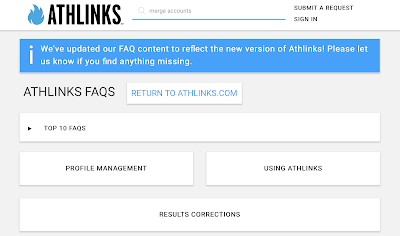 ATHLINKS is the largest results database for competitive endurance athletes in the world. They collect results for running races, triathlon, swimming, cycling, mountain biking and pretty much any timed endurance event that you can find. The results are then added to the database and linked to member accounts. I can easily access my race stats with the click of a button and bring those old race memories back to my mind. See that "new runner that trained on flat roads for hilly trail marathon" look on my face? I remember Marathon #1 as clear as day: Pain cave. Hungry. Cold. But I finished! 2010 Finish Line of My FIRST Marathon Ever => Pain Face. My training and racing strategies have changed greatly since that first marathon (thankfully) and it is encouraging to see progress over the years. My race times don't improve as drastically as they did in the beginning — like jumping from the 4:07 to a 3:34 — but I know I have come a long way personally! I remember Marathon #9 as the latter of my first 2-week back-to-back marathon experience and an amazing experience with my mom and kiddos. My first ATHLINKS account, like my race results, was under my maiden name. After my husband and I were married in 2012, I simply made a new account with my married name to save new race results. 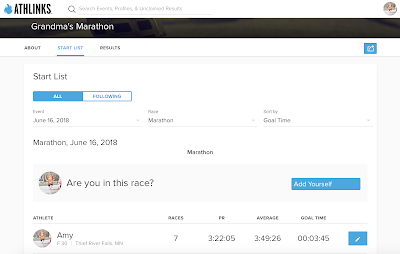 That worked fine but I really wanted to have all of my results in the same account to see the progress from marathon #1 to #9. Merging my two accounts was the goal and I wasn't sure where to start. That brought me to the ATHLINKS Help Desk. I entered "merge accounts" into the search bar and this result popped up: "I have two profiles. Can I merge them?". From there, the Help Desk gave me exact directions on how to merge both of my accounts. I sent the required information to the support team via email and, not even an hour later, they responded to my request. My accounts and all of my race results were now merged into one. Thank YOU, ATHLINKS Support Team! Sign up for your FREE account on ATHLINKS to collect your past race results and add your name to future race starting lists! Of course you should stop by and "Follow" my profile, too ;) If we have ran some of the same races, you and I may even be considered "Rivals" <= It's a really cool feature. I encourage you to check out the running "Rivals" in your area! Now I've added my name and race day goal to the Grandma's Marathon 2018 starting list. Let the new race season begin! (Treadmill) Progression run = 9:00/mile with last 10 minutes @ 8:00/mile. 5.1 mi, 00:45 @ 08:49 avg pace. Rough night of sleep with baby last night! I’m hoping to make it outside early tomorrow morning. (Treadmill) Easy Effort 6.2 mi, 01:00 @ 09:40 pace. Went with the treadmill because the cold, dark morning was unappealing. I’m hoping to avoid this cold that has gone through the family (except for baby and I)! Long Run 11.63 mi, 01:41 @ 08:41 pace. It was a nice morning for a run and I enjoyed a wet, heavy dump of snow for the last 40 min. I’m glad I had my yaktrax on. The roads were terribly icy in town but pretty nice in the country. Easy Effort 3.12 mi, 00:30 @ 09:36 pace. Ran out on the gravel to avoid ice. They were still a little slick and snowy but I did get in some form drills. Feeling good and a little stiff from the all-terrain (snow... ice... snow... ice...) run yesterday! How do you keep track of your race results over the years? Disclaimer: I received SKINS DNAmic Compression Long Tights and DNAmic Speed Sports Bra to review as part of being a BibRave Pro. Learn more about becoming a BibRave Pro (ambassador) and check out BibRave.com to review find and write race reviews! The saying is "fashion or function". Well, why can't you have BOTH? 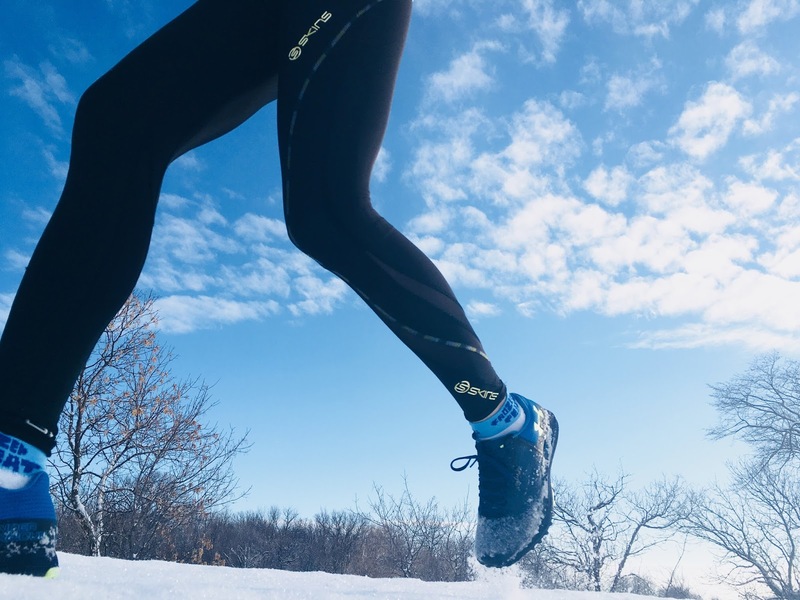 Compression gear is a runner's best friend when it fits correctly. That's not always easy to find though! I have had compression gear that wasn't snug enough and, on the opposite end of the spectrum, some that was nearly impossible to slip on. When I find a product that fits just right, it's certainly worth writing about. As a BibRave Pro, I received SKINS DNAmic Compression Long Tights and a matching DNAmic Speed Sports Bra to review. Would DNAmic gear fit the "perfect compression" bill? Hands down, I would say SKINS' DNAmic compression gear is flattering. It has the right amount of tightness and "holds everything together", if you know what I mean. (Nothing is jiggling!) The material feels smooth and the waistband fits comfortably enough that I wear them through workouts, from long runs to interval sessions, and on non-running days too. I do take them off occasionally to wash, of course! WARP KNITTED mix of yarns that give you a carefully calculated level of stretch for controlled compression and durability. I chose the black tights and sports bra because black is always in style and it goes with everything. Plus it's a guarantee that sweat won't show through, no matter how drenched you are! What is the point of compression gear? Is it worth it? Dynamic Gradient Compression is an advanced compression technology that increases muscle oxygenation, stabilizes active muscles and reduces blood lactate build up, to enhance performance and speed up recovery time. SKINS notes that the DNAmic tights will indeed give you a performance boost. When correctly fitted, the biomechanically positioned panels and seams support and stabilize your muscles to reduce fatigue and risk of injury. The DNAmic Compression Long Tights are versatile enough to wear as a single layer or wear under numerous layers of tights. On the few warm days we have been blessed with (think 20's or 30's) I have been able to run without covering up my SKINS! They feel very light on the run and the performance benefits are noticeable. I always feel faster in compression. The DNAmic material is breathable so I should be able to wear these even on cool days over the summer. One note on the Speed Sports Bra is that the smooth, wide straps don't dig in or cause discomfort like some sports bras can. The material in both the DNAmic Long Tights and Speed Sports Bra is a high quality that I can feel. I have had my share of bad long run experiences with chafing and what not. All of my running, from a 10k race to 10-mile long run, has been chafe-free in the DNAmic tights and sports bra. The SKINS DNAmic Women's Compression Long Tights are $99.99 and the DNAmic Speed Sports Bra is $49.99 plus FREE SHIPPING on every order above $100. Take 20% off your SKINS order by using code "20BIBRAVE" on all non-reduced items at www.skins.net. Off! I felt surprisingly normal after yesterday's 10-mile long run (my first since 2016!). (Treadmill) Hill Intervals 5.11 mi, 00:45. 8x1:00 @ 6% incline with 1:00 jog @ 1% for rest. Progression run for last 15 minutes because it was getting boring! Easy Effort 6.01 mi, 00:58 @ 09:38 avg pace. For being above zero, this morning's run sure was COLD! I had to use every ounce of determination to make myself stay out there. And now the sun is shining and it's 35... I feel nocturnal. 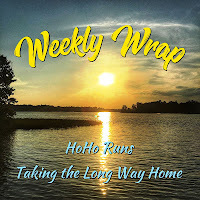 Long Run 11.5 mi, 1:40:28 @ 8:44/mile avg. Outside on a beautiful day! What's your running style? 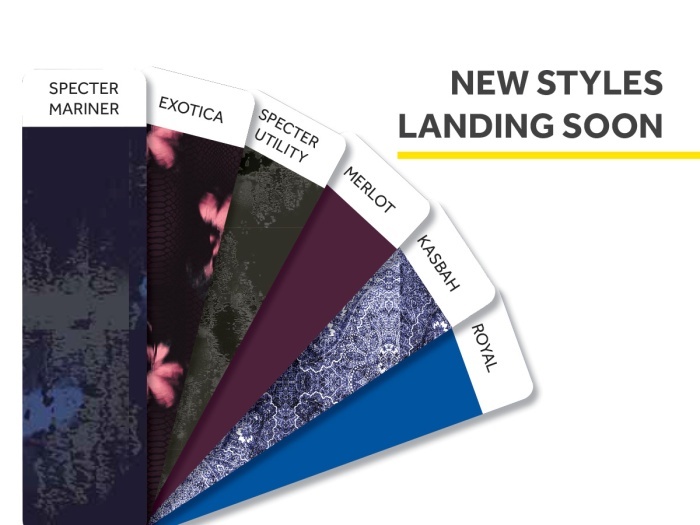 Are you a bold pattern person or on the plain side (like me)?